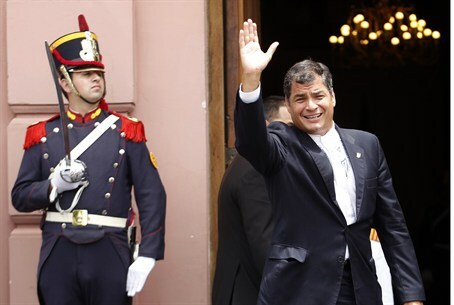 Ecuador denies suggestions that its president downplayed a 1994 terrorist bombing on a Jewish building in Buenos Aires. Ecuador on Friday denied suggestions that its president downplayed a 1994 terrorist bombing in Buenos Aires that killed 85 people at a Jewish charity, AFP reported. President Rafael Correa visited Argentina on Tuesday to receive a prize from a university, and during his stay commented on the attack against the Jewish association known as the AMIA. Argentina has blamed Iran for the blast, which left some 300 people injured. Correa reportedly drew a comparison between the terror attack and NATO's bombing last year of Libyan forces to protect civilians as rebel forces fought to oust Muammar Qaddafi. In a TV interview, Correa said of the AMIA bombing, "I know that case that is so painful for Argentine history. But look how many people died in the NATO bombing of Libya. I respect the Argentine case very much, but we should see where the real danger lies." Jewish groups in Argentina expressed outrage, calling Correa's comments unacceptable. On Friday, however, an Ecuadoran government spokesman denied that the president had tried to downplay the attack on the Jewish facility. Communications Secretary Fernando Alvarado said the president's comments had been taken out of context and misquoted later, according to AFP. He added that the controversy "has spread at such a fast pace that no one has stopped to do the proper analysis." Correa, he said, did not mean to "justify, or even worse, downplay, a terrorist attack that was painful and cruel for Jewish and Argentine families." Argentina said this week it will soon propose an agenda to Iran on talks to settle lawsuits related to the 1994 bombing. Argentine and Iranian officials conducted preparatory discussions in Switzerland in October on the bombing in Buenos Aires. Since 2006, Argentine courts have demanded the extradition of eight Iranians, including current Defense Minister Ahmad Vahidi and former president Akbar Hashemi Rafsanjani, to face charges over the attack, which injured another 300 people. Iran has always denied any involvement in the attacks. Last month, representatives of Argentina's Jewish community asked prosecutors to require that the government report on its meeting with Iran on the bombing.